After what seems like an eternity (well, not quite, but it has been too long), it’s time to finally return to Golarion in the company of that most tried and tested band of adventurers, Valeros, Ezren, Merisiel and Harsk. 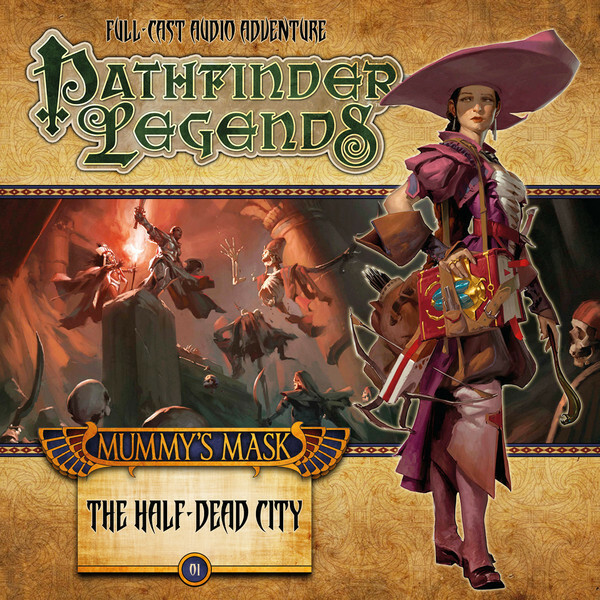 This time, they’ve abandoned the relative safety of Sandpoint and its surrounding locale and have travelled further afield in search of knowledge, treasure and whatever else their quest throws at them. Their thirst for wisdom, or rather Ezren’s desire to discover and learn all that he can, takes them to the Necropolis of Wati, a sealed city whose gates have been opened to all who dare enter the city for the first time in nearly two millennia. But the streets and buildings of the long dead city are filled with the denizens of death and only the most foolhardy and courageous of mortals would dare explore its hidden depths. Which means that its promise of wealth and power, regardless of the danger, are like a red-rag to a bull to our plucky bunch, but unbeknownst to them, it isn’t only monsters they’ll face in the ancient citadel; and the path they’ve chosen is about to lead them, and perhaps even Golarion itself, into even greater peril.